Tessellated triangles are not only beautiful but that they are also interesting. Tessellating them will prove the angle sum of polygons particularly parallelogram, trapezoid, and hexagon. The term angle sum means the sum of the interior angles. Let us start with the knowledge that the angle sum of a triangle is 180 degrees. Copying a triangle with angle measures x, y, and z, and rotating it 180 degrees will give us the first two figures. 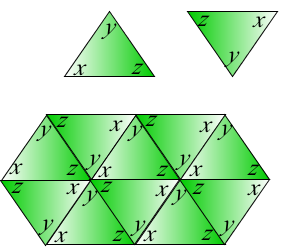 The tessellated copies are shown in the next figure.